MIRI is the mid-infrared instrument of JWST covering the wavelength range from 5 to 28 μm. The instrument provides imaging over a 1.3 x 1.9 arcmin field of view as well as coronagraphic capabilities on the basis of three 4-quadrant phase mask coronagraphs and one Lyot coronagraph. A complex setup employing 12 individual gratings provides high-resolution (R=1000-3000) spectroscopy from 5-28 μm while an additional double prism assembly will yield lower-resolution (R=100) spectroscopy over the range from 5 to 10 μm. MIRI is being developed as a 50-50 partnership between the US and Europe. A European consortium of nationally funded institutes is responsible for building most of the MIRI Optical System while the detectors, focal plane electronics and the cryocooler are contributed by the US. MPIA is a major partner of the MIRI European Consortium led by UK-ATC. The responsibilities of MPIA are (I) the development of optical wheel mechanisms, (II) leadership of the electrical system engineering team, and (III) strong participation in activities such as instrument testing, software development and preparation of the instrument calibration and commissioning in space. 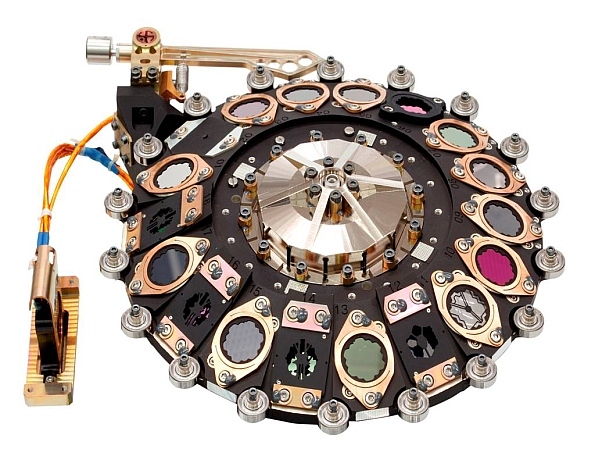 In order to provide all observing modes such as broad/narrow-band imaging, coronagraphy and low/medium resolution spectroscopy, the MIRI instrument is equipped with a filter wheel and two dichroic/grating wheel mechanisms. They allow for a re-configuration of the instrument between the different observing modes and wavelength ranges. The lower MIRI operating temperature of T ~ 7 K provided by a dedicated cooler, much lower than the passively cooled rest of JWST at a temperature of ~ 40 K, implying additional challenges. The main requirements for the three mechanisms with up to 18 positions on the filter wheel (see Fig. 1) include: reliable operation at T ~ 7 K, optical precision of < 4 arcsec, low power dissipation, vibration capability up to 13.5 Grms and full functionality in the temperature range 6 K < T < 300 K.
To meet these requirements, a space-proven mechanism concept based on the European ISO mission and consisting of a central bearing carrying the optical wheels, a central torque motor for wheel actuation, a ratchet system for precise and powerless positioning and a magnetoresistive position sensor have been selected. In order to assure the reliable functionality of the complete wheel mechanisms, they have to undergo extensive testing. All components of the mechanism have been space qualified including 20 cryo-cycles between room temperature and 7 K and radiation testing . The flight model of the MIRI filter wheel (Fig. 1) has been successfully tested and delivered for integration into the MIRIM imager section in September 2009. Currently, the flight models of the dichroic/grating wheel mechanisms are undergoing final tests and are expected to be delivered for integration into the spectrometer unit in March 2010. Fig.1: Flight model of the MIRI filter wheel. The optical elements on the wheel are actuated by a central torque motor, with the wheel positions being locked by a ratchet detent latching into the index bearings outer race. The mechanism has a diameter of 30 cm and a total mass of 3.5 kg. A significant milestone for MIRI was reached in 2008 with the extensive testing of the verification model (VM) of the instrument, making MIRI the first of the four JWST instruments to reach this phase of performance testing. The goal of the VM - as a fully functional instrument model - was to verify the scientific performance and all electrical interfaces, to use a telescope simulator as calibration stimulus and to provide additional confidence on the thermal performance of the instrument. The cold MIRI VM test campaign included repeated functional tests under ambient and cryogenic conditions, alignment and thermal balance tests, electromagnetic compatibility tests, characterisation of the MIRI Telescope Simulator (MTS), and MIRI VM performance testing. Members of the MPIA MIRI team prepared, conducted and analysed a significant number of the tests in two cryogenic test campaigns. The VM test campaign was very successful: Among the tested MIRI performance parameters, the image quality nearly met all the flight model requirements, and also the spectrometer performed very well. In addition, all wheel mechanisms were reliably operated during the whole campaign. The lessons learnt from the VM campaign are currently implemented into the flight model test program which is expected to start in June 2010.